The Philippines is not only home to many famous beaches, mountains, islands, and the like. It is also known for their many talented artists, such as painters, sketchers, sculptors, craftsmen, and more. #1 - Hofilena Heritage House: Hot on the number one spot is Hofilena Heritage House a.k.a. Hofilena Ancestral House, a top-notch art museum you will fall for in Silay City, Negros Occidental, Visayas. According to Wikipedia, Hofilena Ancestral House is the residence of the late Manuel Severino Hofilena and his family, and that he built it for his wife Gilda Ledesma Hojilla, a former Miss Silay, and their nine children. Moreover, this beautiful house turned museum, is under the care of Ramon Hofilena, who is one of the children and heirs of Manuel and Gilda – therefore, he personally tours guests who pay a visit to their home. Among the treasures in this art museum is a collection of more than 1,000 art works that include the paintings and sketches of Philippine artist Juan Luna, Felix Resurrecion Hidalgo, Fernando Amorsolo, Ang Kiukok, Vicente Manansala, H.R. Ocampo, BenCab, Jose Rizal and Spanish artist Francisco Goya. #2 - BenCab Museum: Get up and go to yet another winner art museum in the Philippines, no less than BenCab Museum – real art happening over at Kilometer 6, Asin Road, Tadiangan, Tuba, Baguio City, Luzon. BenCab, or Benedicto Reyes Cabrera, its owner, is known as a master of contemporary Philippine art, according to the company website. 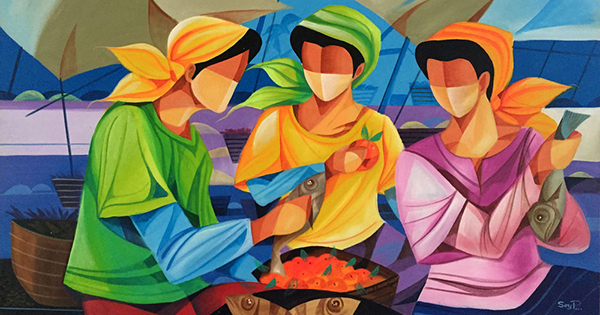 He is a painter as well as printmaker, on top of having exhibited mostly in the Philippines, Asia, Europe and the United States. He is a recipient too, of numerous awards in his career of 40 years. This top of the line art museum highlights the granary gods, lime containers, native implements, weapons and other outstanding examples of indigenous arts and crafts of the Cordilleras. If you get mesmerized by beholding paintings, drawings, prints, sculpture and other collections – your wish has been granted! #3 - Pinto Art Museum: Not so far from the Metro, is amazing Pinto Art Museum! – Download tons of joy over at their door -- #1 Sierra Madre Street, Antipolo City, Luzon – because as you step into this relaxing tourist destination for art lovers as well as foodies, yes, you heard us right! You will also have tummy delight over at Pinto Café, once you are done touring the picturesque galleries, and even appreciating Pinto Art Museum’s adorable architecture! A project of a non-profit organization, led by neurologist Dr. Joven Cuanang, Pinto Art Museum, named after the Tagalog word: pinto, meaning, “door”, is surely THE gateway for modern art in the Philippines. When you gaze upon this superb museum’s collection of over 300 contemporary Filipino paintings and sculptures, it’s like a miracle unfolding right before your eyes … such beauty galore! You’d want to stay some more! #4 - Ayala Museum: We don’t mind saying, Ayala Museum, is something you really wanted from Makati Avenue corner De La Rosa Street, Greenbelt Park, Ayala Center, Makati City, Luzon. Once you begin to view their intrinsic modern art, your smile will be forever tattooed on your mind, even as you learn about the Philippine’s colorful history from such a fascinating art lovers’ attraction. Indeed, Ayala Museum is like sunshine in the universe, by highlighting its collection of artifacts, specifically the Gold of Ancestors: Pre-Colonial Treasures in the Philippines; vis a vis an outstanding selection of ceramics from Southeast Asia and China – the pride of Roberto T. Villanueva. In addition, be awestruck by the textile collection donated by Mercedes Zobel – part of which has been analyzed by no less than the Prince’s School of Traditional Arts in London. #5 - National Museum of the Philippines: Be happy, it’s free to see the arts, so in the National Museum you can be, and that is located at Padre Burgos Street, Rizal Park, Manila, Luzon! The visual arts collection of this impressive national institution is comprised of a whopping 1,032 art works that include easel paintings, sculptures, icons, sketches and mixed media – the real deal treasures from the 18th century up to the late 21st century. These masterpieces meet the country’s demand of storing perpetually how Philippine art develops through the years and highlights the achievements and ideals of many notable Filipino artists. Among the various art pieces the National Museum boasts about is the Spolarium – a painting that features part of Roman history focusing on the bloody carnage brought by gladiatorial matches, created by one of our national artists, Juan Luna from the 19th century.